Afternoon naps for parents, reading a book for me. Back to church in the evening. Cinnamon rolls after evening church. I grew up in a very religious home where God was the center of everything. I remember going to Sunday School and singing songs with fun hand motions, listening to the teachers tell Bible stories on felt boards and with puppets, making crafts, and memorizing verses like it was yesterday. This is what I yearn for my own kids to experience, but what I learned this week is that the only way they will is if I allow them the opportunity. We left the church I was talking about above when I was 11 for which I am sure were relevant reasons to my parents. For me though, I was crushed. I had to say goodbye to my best friends (a couple I still talk to today), leave the church I had grown up in, and start all over again in youth groups that were full of cliques and unfortunately not very welcoming. Or perhaps I was the one not receptive of their welcome, which as a pre-teen could most definitely have been the case! Whatever the case though, even after my parents became members of another church, I never felt that I belonged there. I did still attend church regularly, but honestly only to please my parents. Once I moved out of my parents house, I went less and less and eventually never. Skip a few or 10 years later. As the kiddos have become older it is so important to me for them to learn about God, the Bible, and that He has a plan for their lives. We have visited a few churches and even attended one regularly for about 6 months, but during that entire 6 months nobody ever bothered to get to know us. Now I know it is a two way street and I could have done more to put myself out there, but you would think that somebody would have came to say hello after seeing us there week after week. So eventually we stopped going and spent our Sundays enjoying our family. 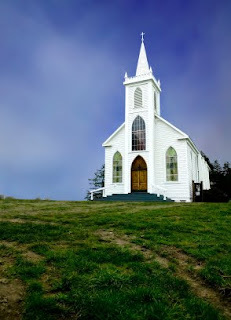 One of the things that really excited me about my parents moving closer was the thought that maybe, just maybe they would find a church they liked and it would work for Dave, me, and the kids too. Well last week they went to a local church and went on and on about how nice everybody was and how welcomed they felt for it being their first time. Dave and I had actually tried the church a few years ago, but I was not happy with the children's program so we moved on. We decided to give it another shot. What I also learned this week was that I have missed going to church. I've missed the singing, praising, hearing His word, and that feeling of renewal after the service. I want need to go to church. 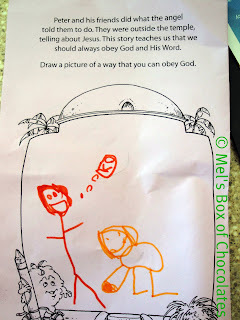 I want my kids to learn more about God and choose to have a relationship with Him. I was excited to get in the car afterwards and talk to the kids about what they learned from the message. I was amazed by everything Zoe soaked in. She was quite intrigued with Jesus dying on the cross and even drew this in her little notebook. Dylan was very quiet during the service and I swear was going to fall asleep, but when I asked him what he learned his answer proved otherwise. WOW. He actually memorized his first Bible verse. I can't wait to go back next Sunday and see what else we learn! So what did you learn this week? I'm glad you're working on finding a Church home. Through all of our moves around the world the one thing that has made it so much easier for me was finding the right Church home. We've met some really awesome people through the years and I still keep in touch with some of them. I'm glad you have found somewhere that you feel comfortable. We just recently switched churches after attending one for over ten years. It has been a hard transition, but that community of believers is so important. I am so glad that you have found the right community. Fellowship is so important! That is awesome! It took us a long time to find the right church home. I can't imagine our life without it now. I feel like I could have written that post. It has been forever since I have taken Abraham to church and I miss it too... thanks for the encouragement.